This code would allow the text layer to show up, however, the Quartz Composition was gone and all I got was a gray window with the “hello World” text on it. This is what I love about NSCoder Night. You get some Cocoa geeks together and the collective wisdom starts this synergy where we can bounce things off each other and a solution emerges. I got rid of the QCView altogether and just added the Quartz Composer layer to the sublayers of the window’s content view. The Quartz Composition in a QCCompositionLayer begins to play automatically, so really this code is all there is to it. And notice that the text overlay works as well. You could really add anything you wanted in a Core Animation layer at this point. If you’re anything like me this will whet your appetite for playing with some very cool technology. I decided to create my own Quartz Composition and include that in the demo project. 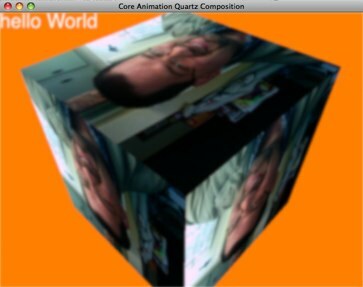 The demo composition takes the vide input of your iSight camera and applies the image to each side of a cube. It then rotates the cube. 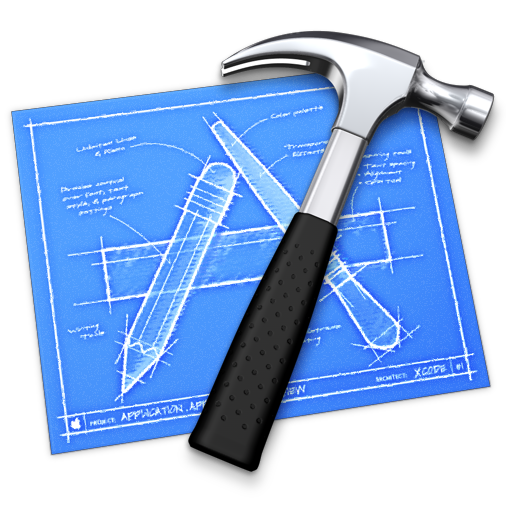 Creating the composition was pretty easy with a cursory reading of Apple’s Quartz Composer User Guide. It’s quite helpful. 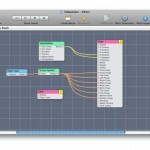 You can take a look at the Quartz Composition in Quartz Composer. The demo application has two .qtz files in it. You can just double click either of those from the Finder to see what I did. The one I’m using in the demo app is the one called “VideoCub.qtz”. You can switch it in the code to see the other one as well, which is a quad of four iSight inputs. You can see I added a CATextLayer to the QCCompositionLayer which displays the words, “hello World”. I also applied a Gaussian blur filter to the whole thing so you can see how easy it is to add filters as well. Here is *all* of the code needed to make this work. What’s even more exciting to me is that if you know a bit of OpenGL, you can do all kinds of other manipulations of the image since QCCompositionLayer inherits from CAOpenGLLayer. Take a close look at -drawInCGLContext in the CAOpenGLLayer API docs. There is a ton of great potential there. The conclusion is that Quartz Compositions are very cool and they are now even cooler since you can work with them in Core Animation. 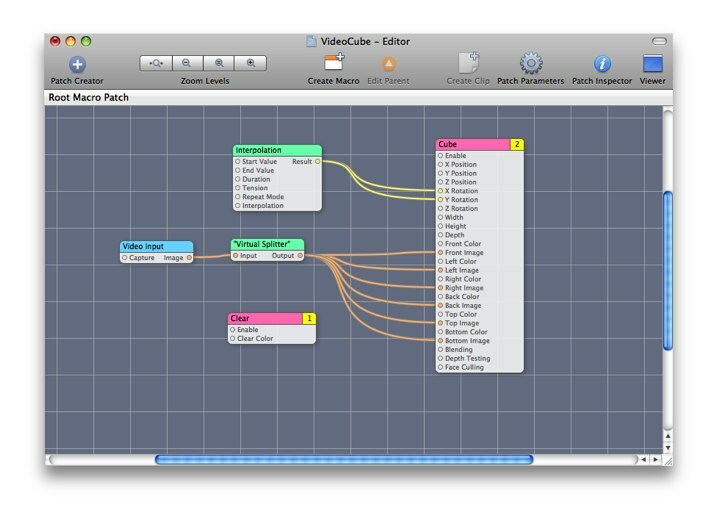 Take a look a the Quartz Composer guide and start building your own compositions that you can easily incorporate into your Core Animation based applications. Until next time.